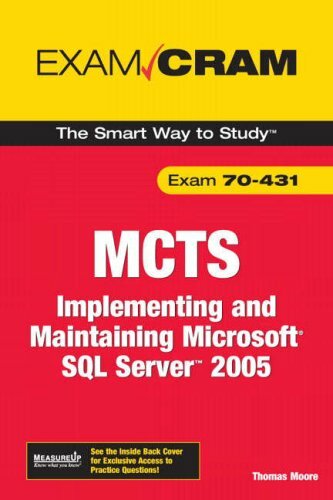 Every Microsoft SQL Server related certification starts with the 70-431 exam that this book prepares you for. To continue along any of the tracks for IT Pro certification, you must pass two other SQL Server specific exams. 70-441: Designing Database Solutions by Using Microsoft SQL Server 2005 and 70-442: Designing and Optimizing Data Access by Using Microsoft SQL Server 2005 are the database developer based continuation points, and 70-443: Designing a Database Server Infrastructure by Using Microsoft SQL Server 2005 and 70-444: Optimizing and Maintaining a Database Administration Solution by Using Microsoft SQL Server 2005 are the two administrator-based alternatives. Exams 70-445: Designing Business Intelligence Solutions by Using Microsoft SQL Server 2005 Analysis Services and 70-446: Designing a Business Intelligence Infrastructure by Using Microsoft SQL Server 2005 are the business intelligence endpoints.